What Is A Certified Scrum Master Course? The Certified ScrumMaster Course is a 2-day course introducing the concepts of the Scrum, the most popular Agile framework. Scrum is a seemingly simple process that can have such profound effects on an organization. Each participant will gain practical experience working with Scrum tools and activities such as the product backlog, sprint backlog, daily Scrum meetings, sprint planning meeting, and burndown charts. Participants leave knowing the different Scrum roles and how to apply Scrum to all sizes of projects, from a single collocated team to a large, highly distributed team. 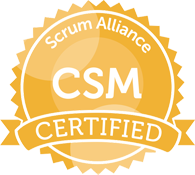 This workshop focuses on covering the CSM learning objectives listed on the Scrum Alliance website. However, we know people are different. Every individual has their own strengths and styles. We will interact with you as needed and design a unique workshop to suite the participants. Who is Scrum for?Whether you’re working on the next smartphone app, managing logistics for a store, or planning a charity event, anyone with a complex project can benefit from using Scrum! What Do You Get Out Of This Course? Qualification for ScrumMaster Certification (passing the exam is a required follow-up step for certification). You will be able to take the test immediately after the workshop and the fee is covered in the course fee. Why Agile Strategic Solutions ?